Anything from 25 upto 100 yards is a common distance for short range target shooting at the firearms range. You’ll also find crossbow, compound and recurve archers who shoot competitively at similar distances. Shooting bullets, arrows or bolts at scoring targets at those distances seeing the finer detail on the results isn’t easily possible without either walking to the target, exceptional vision or some sort of optic to aid you. Physically checking the target up close after every shot just isn’t practical in certain situations (unless you want to risk getting shot yourself!). That’s why spotting scopes are common as a visual aid for judges, competitors and enthusiasts. Outdoor naturists, backyard birders, hikers and some hunters also need quality short range optics because they’re lighter and more easily transportable than those with a longer range. So what’s the best spotting scope for use upto 100 yards? That’s the question we’re going to try and answer for you in this article. For short range applications there isn’t any need to spend a fortune and there are some bargains to be had. We’ve scoured the market, done our research. Written you a short guide and come up with our top picks for you below which we’ll cover in greater detail later on. What Zoom Power / Lens Size for 100 Yards? Well, in the world of spotting scopes 100 yards is entry level on the scale in-terms of capabilities. Some top-end scopes are designed to show you clear images at 10 or 20 times that distance. That’s a scope that can zoom from 15x magnification up to 40x magnification and has a 50mm objective lens. Larger zoom ranges mean you can see further and larger objective lenses mean the scope lets in more light and can give a better clearer picture in both darker conditions and at longer ranges. Larger lenses tend to go hand-in-hand with longer zoom ranges. A variable zoom scope around 15-40x with anything from a 50mm objective lens upwards is just fine for any application up-to 100 yards. You may be wanting to check targets at short distances such as 20 yards or less as well as up to 100 yards. If that’s the case make sure to check the close focus distance parameter on your chosen scope as there will be a minimum distance at which it can focus. Make sure you’re not going to want to see within that distance otherwise the scope just won’t focus for you. Other specifications like eye-relief will concern you if you wear thick glasses or shooting glasses. Eye relief is often specified in mm i.e. 11-14mm and is the minimum to maximum distance your eye needs to be from the eyepiece lens of a scope in order to see the full field of view. If you wear thick glasses, a bigger eye relief will be a necessity. FOV or ‘Field Of View’ is the detail of how much of the landscape you can expect to see at a certain range. To give you a comparison, your field of view at the moment is something like 210° in a horizontal arc. A spotting scope will give you something like 1-2° at 1000 yards. For 100 yard target shooting uses FOV isn’t going to be much of a concern. Hunters, backyard birders and other outdoorsy types however may want a wider field of view for tracking objects more easily when zoomed. There’s a lot of choice on the market today with literally hundreds of scopes targeted to different users and with different feature sets and most importantly of differing quality. One thing to note about scopes is that you can pay large differences in price for the same specifications. The more you spend on a known name, usually the better the quality of the glass and the better the quality of the image you’ll see. You can however take that advice with a pinch of salt when it comes to relatively close range applications like this distance as even the budget bargain basement optics are going to get you an decent enough image of a target in the 100 yard range as they are designed to ultimately see even further. Even at relatively short distances you’ll find it necessary and just plain handy to have some sort tripod on hand to mount your scope. Try to freehand view something at the 100 yard range without one and you’re going to find it difficult to make out the detail of a target with all the handshake that’s going on. Yep, there’s no reason why you couldn’t see even the smallest of target holes clearly at 100 yards with a good set of binoculars mounted on a tripod or rested somewhere very still. 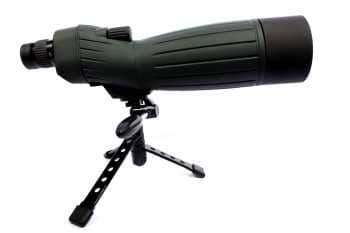 Binoculars may prove more versatile a choice than a scope in that you could use them for other things like tracking game with the increased field of view. An equivalent scope will outdo your binoculars any day of the week at the range. They’re designed specifically for this purpose. Depending on what you’re going to be using the scope for, you need to consider the feature set you’ll want. As we’ve already covered 100 yards is a distance you can want to see at the range, both indoors and outdoors. Waterproofing should come into consideration if you’re expecting to use your scope outdoors and ever get it wet. Extensible sun-shades are also a bonus if you’ll be outdoors. Protection and durability may factor into your decision. If you’re going to keep your scope in a case and take it out to mount on a tripod and use it for range shooting, durability won’t be much of a concern. However, if you want to take it hunting maybe some sort of armor on the exterior will be beneficial. Do you need a straight or angled body? Well whilst we’ve written in-depth on that subject let’s quickly summarize. Straight body scopes allow you a quicker and natural way to quickly sight an object as you’re looking in the same direction as the target. They can be easier to pack and easier to use looking downwards. Hunters and outdoorsmen may favor the straight body scope. Angled body scopes however work better on tripods and window mounts, are easier to share, more comfortable to use looking upwards, and don’t need to be mounted as highly as straight scopes. 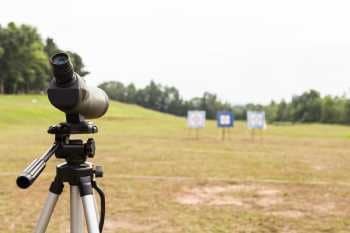 Birders, naturists, target shooters and range shooters may favor the angled body scope for these reasons. Unlike some of the poorly fronted ‘Made In China’ scope manufacturers Barska is a name you might have heard of. They have a presence in the US and a decent website detailing their products and you’ll find their gear in many sporting goods stores. This isn’t waterproof or fogproof. It comes with only basic shock-proofing armor down the sides. The lenses in this are fully coated which means that all glass exposed to air is coated and not the internals. The Colorado is the Barska entry level scope and for use at 100 yards you can’t beat this one on price. A price at which you wouldn’t expect to get a tabletop tripod and a soft case included, but you do. This is a straight scope, so you’ll need to mount or rest it at eye level and don’t expect to see clearly over 150 yards, that’s just not what this is designed for. It also doesn’t have the largest eye relief of this roundup with only 13-10mm. That may not be adequate if you want to use it with spectacles or shooting glasses. GoSky doesn’t have a flashy website or a well crafted, time honored reputation however they’re made some very effective and well priced scopes that get the thumbs up from us. When you’re looking for something for short range shooting, there’s no need to spend a fortune. This entry level GoSky is a step above our last entry in terms of both quality and price. The 45° angled eyepiece means this scope will sit well on the included tripod for shared and continual use. It also allows you to rotate the eyepiece around the body meaning that you’ll be able to use it on a car window mount without any stress. This scope has a respectable eye relief of 18.5-15mm so would be usable to anyone with all but the thickest of glasses. It’s light, comes with soft carrying bag and the usual snap on lens caps. You’re also fine wanting to use this for short range targets too as the close focus range is 6m or about 18 feet. GoSky also include a basic thumb-screw digiscoping adapter with this scope. This is great if you want to take pictures of nature or indeed targets. But be warned it isn’t the easiest accessory to use and can be a little fiddly to attach, remove and indeed setup your phone for a shot using it. This scope IS waterproof and fogproof which is great for rainy days at the range and has a retractable sun shield for the opposite end of the weather spectrum! One thing to note about this scope is that is is actually badged on the side as a ‘birding’ scope but that doesn’t stop it being a great little performer for any other 100 yard application. Celestron are a big name in the optics world. They make a lot of optical equipment from telescopes to microscopes. Spotting scopes are also part of their lineup and the Ultima is a slightly more pricey scope that offers a good quality optic in a variety of different guises. We picked the 65mm 45° angled scope to take a closer look but you can also get this one in straight and angled variants with 80mm and 100mm objective lenses. As those objective lenses get bigger, so does the scope size and weight. The 65mm is the lightest and most compact of all the choices and ideal for short range applications at anywhere up to and over 100 yards. 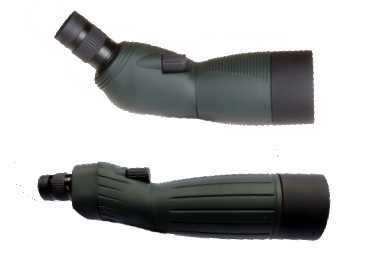 The sight tube on the left gives you a quick way of finding objects outside of the actual eyepiece. That’s handy if you’re going to be switching views a lot. Decent eye relief (18mm), fogproof, waterproof, multi-coated optics, great 6m close focus for short range applications. A tripod isn’t included, but that gives you the opportunity to find a good aftermarket one as sometimes the quality of ‘freebies’ can leave a little to be desired. This is an excellent optic for 100 yards and more. Roxant aren’t a household name either. At least not yet. They’re looking to produce ‘cool’ products that fill a niche and this Blackbird is one of them. This scope is well priced and designed to give clear images all through it’s limited 12-36x zoom range. That’s enough magnification for up to around 150 yards and indeed the images a bright and clear in that range. One advantage of this scope over others is the fact that the front lens cap is attached to the body and can’t be easily lost. A neat feature if you’re prone to losing them, however if you’re out and about a lot with the scope then the lack of waterproofing to compliment a shun-shade lets this one down.